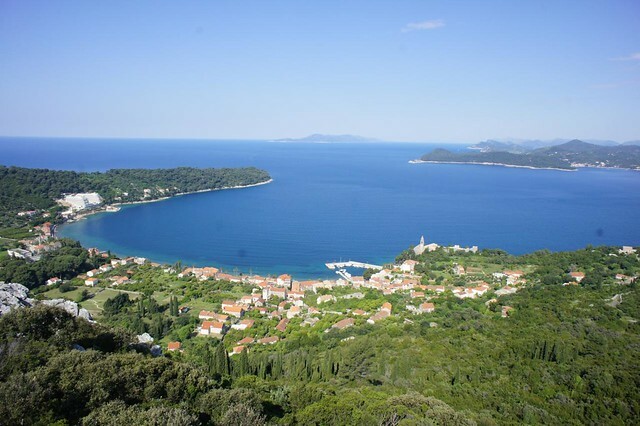 Accessible in about 2 1/2 hours by plane from the UK and serviced by direct flights with the likes of Easyjet, BA & Wizzair, getting to Dubrovnik, in Croatia couldn't be easier. 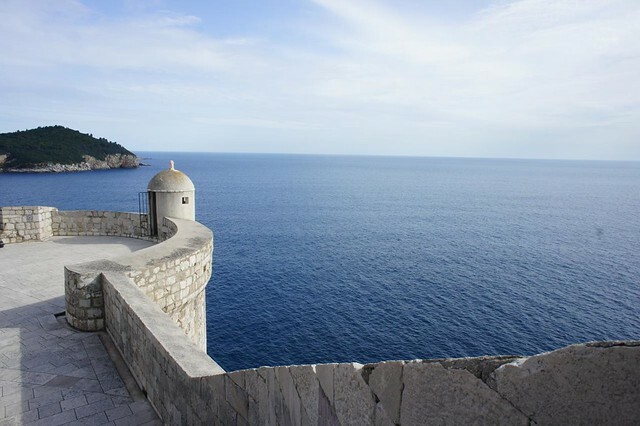 Whether you are going for a city break, or passing through on the way to visit elsewhere in the country, this guide of things to do in Dubrovnik has been put together to help you make the most of your time there. 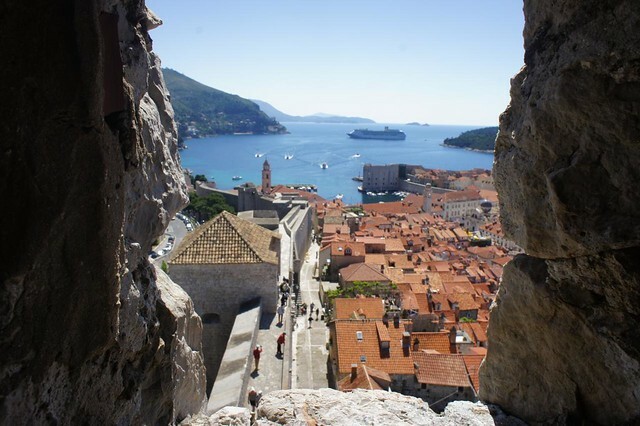 A walk around the ancient city walls is an absolute must do when you visit Dubrovnik. Stretching 2 - 3km, the ramparts are all in excellent condition and give fantastic views across the terracotta rooftops and out to the sea beyond. Depending on how fast you walk, it will take you 1 - 2 hours to walk around the full perimeter. Our advice, take your time and savour the experience. There are plenty of places to stop along the way to buy water or ice cream. Beware, though, your ticket does not allow multiple entries to the walls. 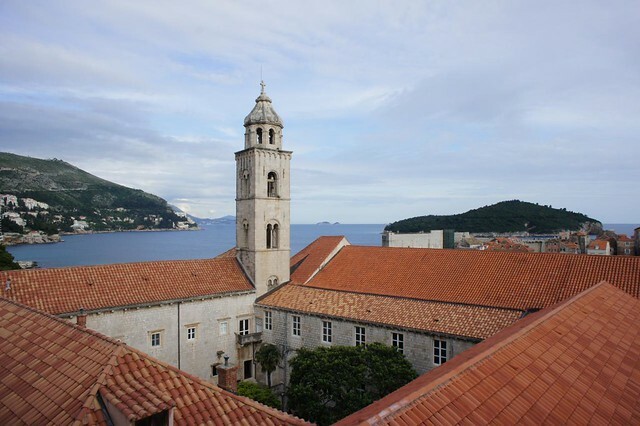 The Dubrovnik municipality used to be run from the Rector's Palace, with a new Governor installed every month. Now, the Palace hosts a collection of historical objects. Visitors can see the old courtroom, prison cells and (faded) state rooms. On the ground floor there is an interesting photography exhibition that makes the visit worthwhile. A collection of photos from the 1991 city siege gives a real flavour of what the city went through during the bombardment. Dating back to the 15th Century, it is worth visiting the Dominican Monastery for the cloisters, which offer a cool respite from the heat of the day. 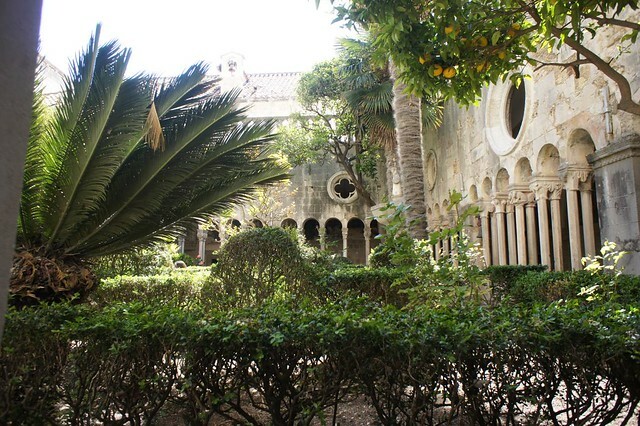 Gothic arches surround a peaceful courtyard filled with orange trees and palms, with a well in the centre. 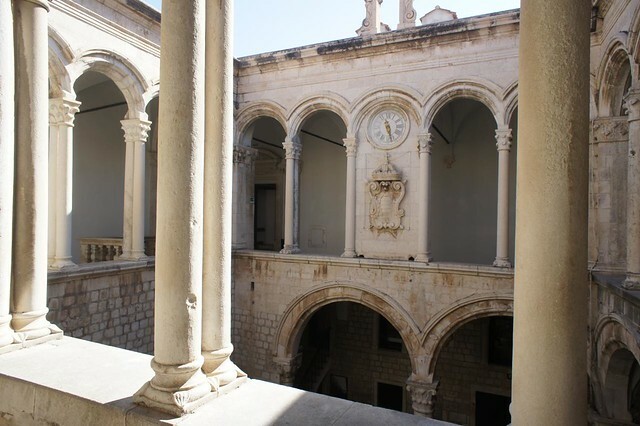 It's worth taking a seat in the courtyard - there aren't many places in Dubrovnik where you can sit back and watch the world go by which aren't selling food and drink. Even if the building itself leaves you cold, you will be sure to amuse yourself with the large groups of cruise ship tourists who descend every 15 minutes in their droves like a swarm of locusts, take a few snaps and then depart as quickly as they came. Dating from the early 1300's this monastery also has beautiful Romanesque cloisters which are worth a visit. Although hit them at the peak time and they are rammed full of tourists. Try visiting early / late for a more peaceful visit. There are many eateries around and you won't be short of an opportunity to find something to eat. For the most part, restaurants are dominated by the pizza category, but there are also some places selling fresh fish, there is even a brand new sushi & oyster bar in town. Probably the best pizza joint is Mea Culpa, popular with locals and tourists alike. Situated on one of the streets parallel to the Stradrun, it is a great place for people watching. The pizzas are generous. If you are after a romantic setting, you can't do better than the Buza Bar. Notoriously difficult to find, this bar is popular with locals as well as tourists. It is perched on the side of a cliff and leads down to its own rocky bay where you can swim from. 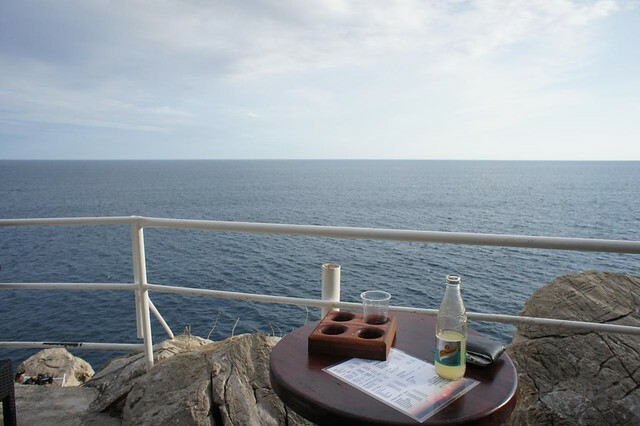 Accessed through the city walls, there is no running water, so drinks are of the bottled variety, but you don't come here for the gourmet, you come for the views and proximity to the sea. The large cruise ships bring tourists in their droves to Durbovnik. This is a good thing for Croatia's economy, so it shouldn't be lamented too much, but there is no denying that the hoards of large groups can detract from the charm of the historic old town. They come to land and do a whilrwindtour of the sites and leave again the late afternoon. Your best bet of avoiding the congestion is to visit the most popular sights early morning or later in the afternoon and to explore the quieter parts of the town, or enjoy a long, lingering lunch, during the 'rush hour'. Like any touristy European city, prices here are not cheap. That said, portion sizes are generous and when you're sitting al fresco in a medievel town, you don't mind so much! Expect to pay around £10 for breakfast, £12 - £15 for a main meal with a soft drink. Beers will set you back around £2 for a small draught and a bottle of wine comes in around £8 - £10. There is some fantastic hiking to be done in the foothills and mountains in the Konavle Region south of the city. If peaks are your thing, you can climb Mount Srdj, which is 412m high. To reach the summit, you follow a winding pathway (the Serpentina) to the top for some fantastic panoramic views. The Elaphite islands, a cluster of islands north of Dubrovnik, offer a delightful opportunity to sample the more leisurely pace of life, away from the crowds. Easily accessible by ferry, they make a great day trip or multi-night stay. A relatively new activity to the area, sea kayaking is a fantastic way to explore the coastline and get away from the mainstream tourist trails. There are only a few operators offering tours by kayak and only one of them is locally owned and operated. Tours range from a few hours, where you kayak directly from Dubrovnik to get a feel for the city and coastline from the sea, to multi-day tours based out in the Elaphite Islands.